Tasty chewable tablets that promote healthy skin and a radiant coat. Looking to stop or at least limit nasty year round shedding of your dog? It can be done and it can be done without the aid of chemicals. Shedding should be a seasonal event for your pet. If your dog has severe shedding and it does not appear to be seasonal, you should take a look at what Derm Tabs ES can do for your dog. Derm Tabs ES is a tasty dietary supplement for your pet that will help decrease your pet's shedding. In just a few weeks you will notice not only less shedding, but less cleaning of your pet’s hair around your home. Derm Tabs ES not only reduces the amount of shedding for your pet, but it is also loaded with natural oils, natural vitamins and natural minerals that will provide a healthy coat for your dog at all times of the year. 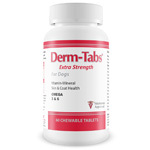 Derm-Tabs® chewable tablets effectively reduce unwated shedding and promotes healthy skin and a radiant hair coat. DIRECTIONS:Tablets may be crumbled and mixed with pet's food to help with administration. After 6 weeks, the dosage can be reduced if positive results are seen. Since each pet's body is different, results may take longer in some pets. Store in a cool,dry place,out of the reach of children. Keep tightly shut to preserve freshness. For use in dogs only. Other Ingredients: Calcium Phosphate, Microcrystalline Cellulose, Sucrose, Natural Liver Flavor, Hydrolyzed Vegetable Protein, Silicon Dioxide, Magnesium Stearate.